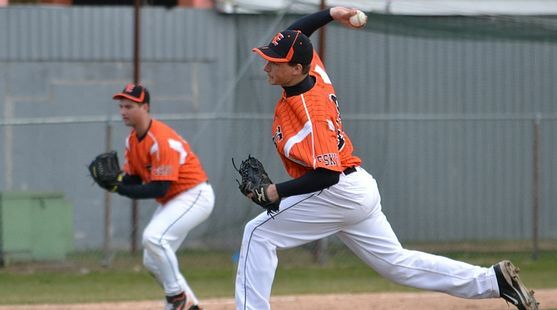 ESCANABA----Escanaba High School junior David Falish has been named to the Division Two Academic All-State Team by the Michigan High School Baseball Coaches Association. Falish has a 4.0 grade point average for his first three years in high school. On the field, Falish batted .310 this spring, with an on-base percentage of .442. He stole 22 bases, tied for second on the team. Falish also threw 39 innings on the mound and had a 4.27 Earned Run Average. He is pictured here throwing against Rudyard. Besides playing baseball, Falish was also a member of the Eskymo football and wrestling teams in the 2011-12 school year. In Division Three, Negaunee's Tony Zampese also made the Academic All-State Team. He and Falish are the only two Upper Peninsula players to get All-State honors.